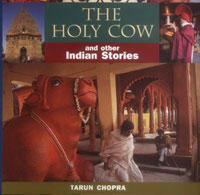 Reading this book called “Holy Cow” by Karan Chopra – it’s such a delight. It’s written for first time tourists to India. Our country is so colorful. And we hardly notice. Reading about the Mughals, Hinduism, Buddhism, Sadhus – it is somebody telling me everything I know……. for the very first time. And you know what? That changes everything! For example, when Mumtaz Mahal was dying, a tear drop fell from her eyes and rested on her cheek. ShahJahan picked it up on his finger and said ‘I will build a monument that looks exactly like this tear drop, descended from heaven and eternally frozen on earth….” That is how Taj Mahal was built. While Taj Mahal was being built, a small city called Mumtazabad sprang around it. Imagine this…. Taj Mahal being built… 500 elephants bringing marbles, silver and gold to Yamuna… Craftsmen, engineers, workers….. The whole place hustling bustling for over 20 years with one goal… To create an eternally frozen tear drop on earth…. Or did you know that Ganesha, the elephant God has only one tusk. He broke one off while writing Mahabharata (which was dictated in one sitting by Vyas) to use as a pen. Or that Jain religion favors extreme form of ascetism. They wear those white masks because they do not want to kill an organism while inhaling or exhaling. Or that 85 temples dedicated to love and passion were built, out of which only 22 remain and Khajuraho is the most well preserved. I am really enjoying this book. Really. It’s about rediscovering what I have known all my life and there is nothing more interesting than looking at something you know and you think you understand very well in a new perspective. PS: Do not confuse this with another book called Holy Cow by Sarah MacDonald. Adversity causes some men to break… others to break records. It has been a long wait. Finally, I have an internet connection at home. It was in 1999 that the 19 year old me put up the first www.abhishekkumar.cjb.net on internet. I had no computer then. Working on a friend’s machine, taking the files in a floppy to a browsing center (which was 1 and a half hours away by local bus) and uploading it – seems almost surreal now. The computer did arrive in 2001, but living on the net took almost five years. Using the college internet connection while doing my MBA and then again browsing centers accounted for the site that you see now. Finally, a few days back – the Sify guys came in and installed the connection. And I can now update this web site, more often, as often as I want, from the privacy of my own home. Feels great. 🙂 I am sure I will be able to add a lot more value, make the site even more interesting and fun now. Look out for several new free gifts coming your way and the new Abhishek’s store. Hope you keep coming back. The action is just about to begin. I had read a wonderful book called ‘The Greatest Salesman in the world’ a couple of weeks’ back. This time in B’lore, I was visiting this book Shop called Oxford and I saw ‘The greatest secret of the world’ which is like a sequel and application-manual for the earlier book. Bought it. Also bought “The richest man in Babylon” which was recommended by Tony Robbins. Started working on “The greatest secret of the world” – hope to continue with the program. Will take 45 weeks in total. Gotta do this one! !